As we head into the holiday season I wanted to offer our CSA gift certificates as an option. Our 6 week subscriptions come with a weekly loaf of Rustic French Bread or Sourdough, and a plantable holiday card for $150 (pickup) and $180 delivered. This offer is good through December 20th. Please contact me for more details. We make gift giving super convenient and nothing is better than the gift of health. Need more veggies this week? Feel free to upgrade to a LARGE share for the current week, just remember to change it after Wednesday. Log into your account here to make those changes. Wendy, at Deux Bakery is making pies for our CSA on Wednesday. $25 each. They will be made early Wednesday morning and will be included with your CSA share if desired. If you haven’t already ordered one please contact me and let me know which flavor you’d like. She gave us a list of them, but is really willing to make anything you’d desire. Cindy Dollar is cooking up some seasonal pumpkin spice granola this week. It’s made to order and would be a great addition to any holiday meal. Gluten Free or Certified organic, just let me know when you check out in our CSA store here. I wanted to say how thankful I am for our nutrient rich soil here in Goleta, for the weather that continues to amaze me, for the workers that put countless hours in each week to make sure we all are eating well and for the supportive community that surrounds me. I feel so lucky and blessed to be able to be in the middle of all this!!! Happiest Thanksgiving to you, your family and all the loved ones surrounding you. This entry was posted in Uncategorized on November 24, 2014 by Carolyn. We are in the midst of planning for a lot of things right now for the CSA. The first is the holiday schedule. Please make sure to log into your account here and put your share on hold for the week of Thanksgiving (next week) if you do not need it. It really helps with the planning that is going into making these special. We will not be making boxes December 24th or 25th. No need to put your account on hold, we’ve done it for you. We are also planning for our 2 acre new orchard that is going to be planted this spring (if all goes well). We’ve received a lot of great feedback into different varieties that could be included and we are going to start trying different varieties in our CSA shares too. This week we have some heirloom apples and red sensation pears. Cindy Dollar is cooking up some Cranberry Cashew granola this week. MADE TO ORDER! Certified Organic or Certified Gluten Free, it’s very tasty stuff. Order your bag through our CSA store here! This entry was posted in Uncategorized on November 18, 2014 by Carolyn. A heads up, because the holidays are right around the corner. We will not be open the week of December 25th. We are taking a much needed break before we embark on a huge year ahead of us. We will be back up and running for the week of the New Year. Cindy Dollar is cooking up some excellent granola and Walnut Spice is the flavor this week. Please make sure to choose Certified Organic or Certified Gluten Free, or you will receive the organic version. Sugar snap peas are back in our CSA shares! We also have a lot of extra persimmons, apples and spinach to sell here in our CSA store. This entry was posted in Uncategorized on November 10, 2014 by Carolyn. It’s November! I was very happy to turn the clock back and be able to wake up to the sun shining. It really helps me get started earlier here on the farm. Hopefully everyone enjoyed the rain Friday night and Saturday morning. It was very welcome here!!! Everything was drenched and blissful. Granola of the week is Raisin Pecan. It can be made in Certified Gluten Free OR Certified Organic. If you don’t specify we will make the organic version. The granola is made right here in Goleta and is mighty tasty. Check it out in our CSA store here! We had a bike farm tour come through on Saturday and John Givens talked a bit about the bugs that have been a challenge this year. In particular, the bagrada bug has seriously depleted our supply of brassicas. Those include collards, cabbage, cauliflower, broccoli, mustards, kohlrabi, bok choi and more. In fact we haven’t even had the chance to grow a lot of these without serious devastation to the crops. I’m trying to keep the best varieties of vegetables possible in our CSA shares, but it’s been a challenge when our choices have dwindled. Here’s a picture of the nasty little devil. 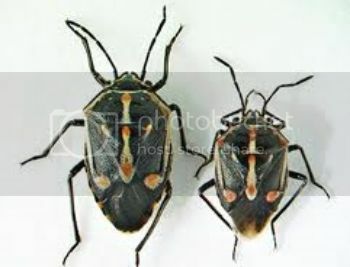 It’s a stink bug variety and does not have any predators locally. It came from halfway across the world about 2 years ago. It’s easy to kill with commercial pesticides that are harmful to people and the environment which is why you will still see a lot of it currently growing. We will keep striving to maintain a variety of fruit and vegetables in the shares. Sugar snap peas, red peppers and satsumas, to name a few, will be in action soon. We are hoping to see carrots back in a few weeks as well. Lots of delicious tomatoes in the mean time. We’ve had a great run with zucchinis but they are quickly drawing to an end. This entry was posted in Uncategorized on November 3, 2014 by Carolyn.